A healthy environment for children starts with a strong family and a home. Without these moorings, children are vulnerable to abuse and neglect, leading to crisis intervention from child protective services. Many families involved in the child welfare system face deep and persistent poverty, depression and mental illness, domestic violence, and drug addiction (Courtney, McCurtry, and Zinn 2004). These intense needs are often exacerbated by homelessness or unstable housing, which increase financial, mental, and physical stressors on children and parents (Min Park et al. 2004). Families sleeping in cars, garages, homeless shelters, or doubled up in untenable situations often wind up “in the system” and at risk of dissolution (Cowal et al. 2002). These families bounce from one social service agency to another, imposing substantial costs to communities, all while their needs remain unmet (Samuels 2014). Children separated from their families and placed in foster care often grow up to lead troubled lives (McDonald et al. 1997). Despite overwhelming data that shows the challenges child welfare families face are complex and difficult to overcome, practitioners and policymakers are searching for solutions. One promising approach is supportive housing, an intervention that combines affordable housing with intensive wraparound services. Supportive housing uses a Housing First model that focuses on providing housing as quickly as possible; it doesn’t push requirements for housing such as sobriety or agreement to participate in services. The supportive services, which focus on long-term housing stability, recovery from addiction, education, and employment, are voluntary and are provided after housing is stabilized. Stabilizing a family’s housing allows them to focus on participating in services rather than worrying about where they will spend the night. Supportive housing comes out of the movement to end chronic homelessness among adults with serious mental illness and drug addiction. Previous research conclusively shows that the model works for this population, a group of people experiencing homelessness that were once described as “un-housable” (Tsemberis, Gulcur, and Nakae 2004). Promising evidence from Keeping Families Together, a pilot program that provided supportive" housing to homeless families involved in the child welfare system in New York City, suggests that supportive housing can help high-need families too (Tapper 2010). 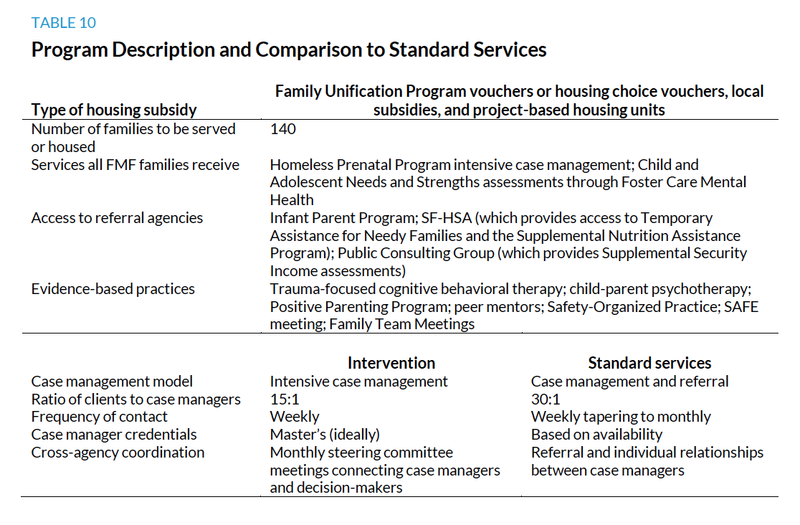 The results from this pilot led policymakers to fund a multisite demonstration—Partnerships to Demonstrate the Effectiveness of Supportive Housing for Families in the Child Welfare System—to test the supportive housing model on a wider scale, understand how to target scarce resources, test efficacy, and measure return on investment. In May 2012, the Department of Health and Human Services (Administration for Children and Families, Children’s Bureau), in collaboration with four private foundations—the Robert Wood Johnson Foundation, the Annie E. Casey Foundation, the Casey Family Programs, and the Edna McConnell Clark Foundation—launched the demonstration. The demonstration provides $5 million five-year grants to each of five sites across the country—Broward County, Florida; Cedar Rapids, Iowa; Memphis, Tennessee; San Francisco, California; and the state of Connecticut—to provide supportive housing to homeless and unstably housed families who are involved in the child welfare system. evaluating the effectiveness of their site-specific service model. 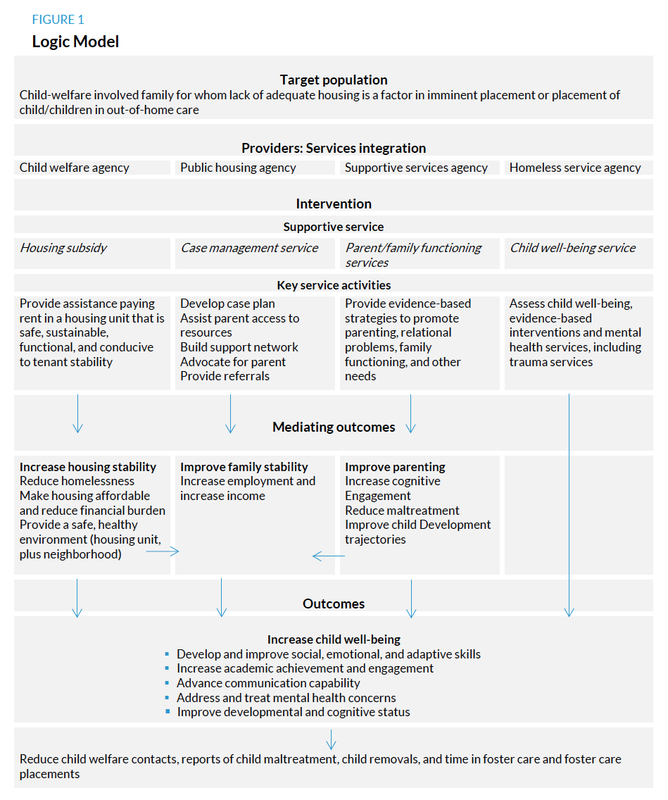 The goals of the demonstration are to reduce child welfare involvement and improve child well-being through increased housing stability, improved family stability, and improved parenting (see the Logic Model in figure 1). The demonstration includes resources for technical assistance, a local evaluation, and a national evaluation to examine outcomes across each of the five sites. CSH (formerly the Corporation for Supportive Housing) and the Center for the Study of Social Policy provide technical assistance to the sites. The Urban Institute is conducting the national evaluation. The local evaluators in each site are Barry University (Broward County, FL); the University of Iowa and the National Center for Family Homelessness (Cedar Rapids, IA); University of Connecticut (Connecticut); University of Tennessee (Memphis, TN); and Chapin Hall at the University of Chicago (San Francisco, CA). Supportive housing is an intensive intervention and a scarce resource. Only the highest-need families—those facing such complex challenges as substance use and mental health issues and for whom housing is a factor in the imminent placement of children in out-of-home care—should receive supportive housing. Each site designed its own targeting criteria within a federal framework to ensure that supportive housing served families for whom the program would likely have the biggest effect. Child welfare–involved families. Families most likely to experience negative child welfare outcomes (e.g., out-of-home placement, long-term open cases, reentry to the child welfare system in the form of re-reports of abuse or neglect, and repeat open cases). Families with high service needs. Families with multiple needs, such as mental or physical health problems, substance use, or disabled children. Families with severe housing issues. Families who are homeless or unstably housed. Using these targeting criteria, case workers at the child welfare agency or homelessness organization identify families for the program. Do supportive housing programs keep families stably housed, reduce their risk of entering the child welfare system, and improve their health and social and emotional well-being? 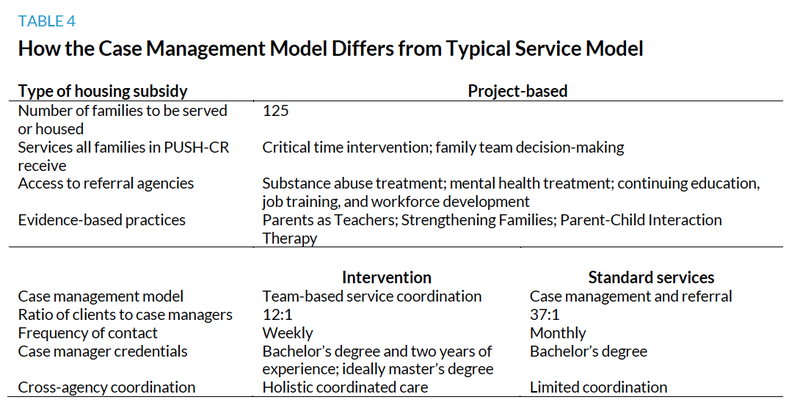 How are the models of supportive housing defined at each site? Does each model effectively target services to families at high risk of continued child welfare involvement and family instability? Are the models able to integrate their services and get families the services they need from the various systems they must interact with? 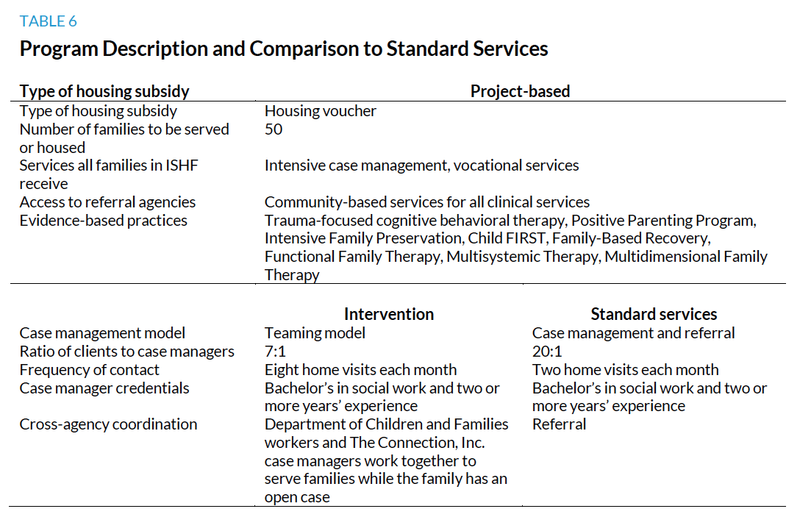 How much do supportive housing models for child welfare–involved families cost, and are they cost effective? Do they produce savings across service systems such as the child welfare and the homelessness systems? Targeting and Prediction Study. This identifies which types of child welfare–involved families are at highest risk of negative child welfare and housing outcomes and which would benefit most from a supportive housing intervention. This study will use child welfare and homeless system administrative data. Implementation and Process Study. This helps us understand how each demonstration model works, is put into practice, and develops over time in each site. We will compare model components across sites. This study will use data from annual interviews with program planners, administrators, and frontline staff. Impact Study. This measures differences in key system outcomes between families in the demonstration and similar families not in the demonstration in each site. This study will use family survey data as well as administrative data from the child welfare system, homeless system, and other systems. To understand how supportive housing drives outcomes, we will conduct in-depth interviews with families. Cost Study. This measures the financial effect that supportive housing has across multiple systems. This study will use family survey data as well as administrative data from the child welfare system, homeless system, and other systems. This rigorous study will help policymakers better understand the effectiveness of the supportive housing model for high-need, multisystem, child welfare–involved families. It will also help policymakers make cost-effective decisions that maximize benefits for families and children. Below we provide an overview of each demonstration site and its supportive housing models. Roughly 2,400 children are in the Broward County child welfare system, and the Broward Sherriff’s Office handles 60 child abuse and neglect investigations each day. Housing is a significant barrier to stability for these families; rents rose significantly between 2012 and 2013, but wages were stagnant. Subsidized-housing wait-lists are closed and the shelters are often full. The community partners view HEART as an opportunity to serve its highest-need families by combining affordable housing and long-term services. 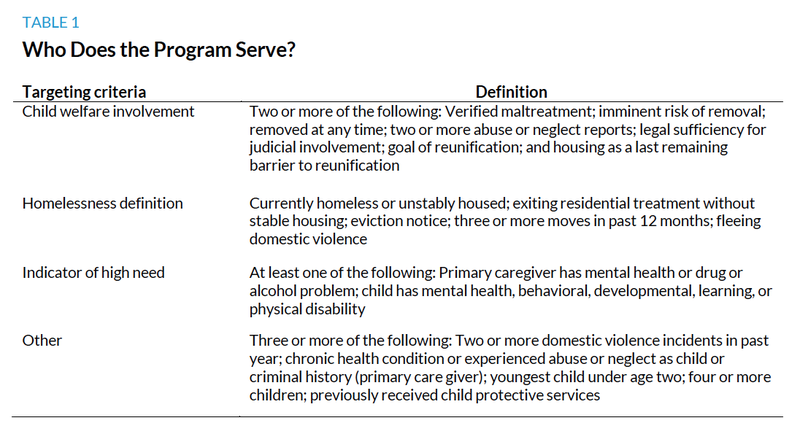 From a services integration perspective, HEART provides an impetus for greater collaboration between the child welfare and child protective services agencies, housing authorities, and service providers; the program improves service to all families in the system (see tables 1 and 2 for more details). HEART is led by Kids in Distress, Inc. (KID), a community organization with extensive experience providing family-strengthening and child services. 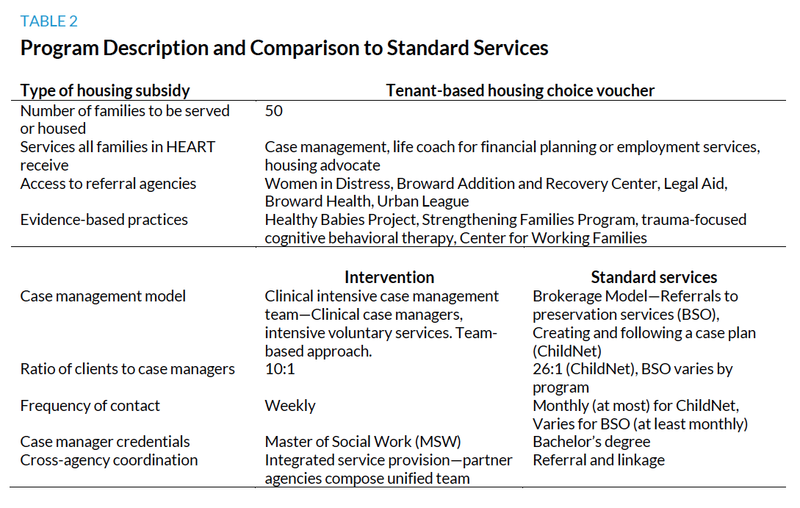 Five public housing authorities—Broward County Housing Authority, Pompano Beach Housing Authority, Deerfield Beach Housing Authority, Fort Lauderdale Housing Authority, and Dania Beach Housing Authority—provide housing choice vouchers to families. KID also partnered with ChildNet, the child welfare agency in Broward County, and the Broward Sheriff’s Office, which provides child protective services. Both agencies identify families eligible for the demonstration. KID delivers intensive, clinical case management and serves families in coordination with the Urban League of Broward County, Broward Health, Broward Addiction Recovery Center, and Women in Distress. Other HEART partners include the Broward County Homeless Initiative (the local continuum of care) and HOPE South Florida, which provides emergency shelter and transitional housing. Barry University is the local evaluation partner. The incidence of children in out-of-home care in the state is high: about 13 children per 1000 are in out-of-home care, almost twice the national rate. Locally, around 700 families are in the child welfare system. On any given day in Linn County, approximately 882 children are homeless. PUSH-CR is designed to help meet the need for housing and coordinated, intensive services for these high-risk families in Linn County, Iowa. Before PUSH-CR, no supportive housing programs served high-risk families in Iowa, though the need for such services had been growing for some time (see tables 3 and 4 for more details). PUSH-CR is led by Four Oaks, a Cedar Rapids–based, statewide nonprofit agency with extensive experience providing child welfare and behavioral health services. Four Oaks is partnered with the Cedar Rapids Service Area Department of Human Services, the Affordable Housing Network (a subsidiary of Four Oaks), Waypoint (a community family homeless and domestic violence shelter provider, experts and evaluators from the University of Iowa, and others. Referrals are made by the Iowa Department of Human Services and local shelters. The PUSH-CR team has expertise providing human service, conducting outreach with vulnerable populations, and collaborating across public and private organizations. The University of Iowa and the National Center for Family Homelessness are the local evaluation partners. In 2010, there were 4,462 children in care, the vast majority of whom (92 percent) came to the attention of child welfare authorities because of neglect, with housing as a major contributor (Harburger and White 2004). Further, about 2,700 children were served in shelters in Connecticut in 2012. Connecticut has a long-standing supportive housing program for families involved in child welfare called Supportive Housing for Families. However, the waitlist for the Supportive Housing for Families program is over 800 families long and growing. 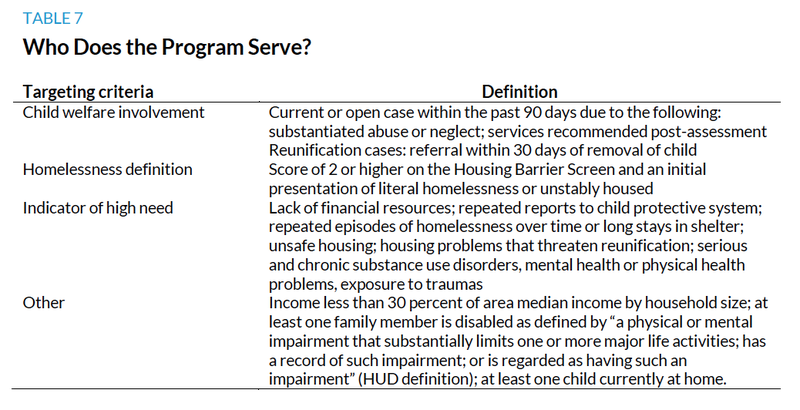 Through this demonstration, Connecticut seeks to expand and augment the current supportive housing services to test a more intensive model of supportive housing (ISHF) to meet the extensive needs in the state (see tables 5 and 6 for more details). The Grantee is Connecticut’s child welfare agency, the Department of Children and Families. Department of Children and Families caseworkers refer families for ISHF, and the department contracts out to provide ISHF participants with services. The Connecticut Department of Housing and the Department of Children and Families both provide housing vouchers for ISHF participants. The Connecticut Department of Housing dedicated some of its existing vouchers to the program, and the Department of Children and Families bought some additional vouchers. The Connection, Inc. provides intensive case management; they have been providing case management for the Department of Children and Families for the existing supportive housing program for over 10 years. The University of Connecticut is the local evaluation partner. The Shelby County Children’s Bureau handled 15,320 cases in 2012, committing 816 children to protective services. Homelessness in Memphis plays an all-too-prevalent role in child abuse; locally, more than one in five substantiated maltreatment cases cite housing as the primary concern. Affordable housing is often difficult for families to find, and the Department of Children’s Services frequently struggles to assist families working to reunite with their children. In 2012, 528 families in Memphis became homeless, and data from the homeless system shows that 25 percent of children who received emergency housing assistance are at high and very high risk of child maltreatment based on a research-based instrument known as Structured Decision Making. 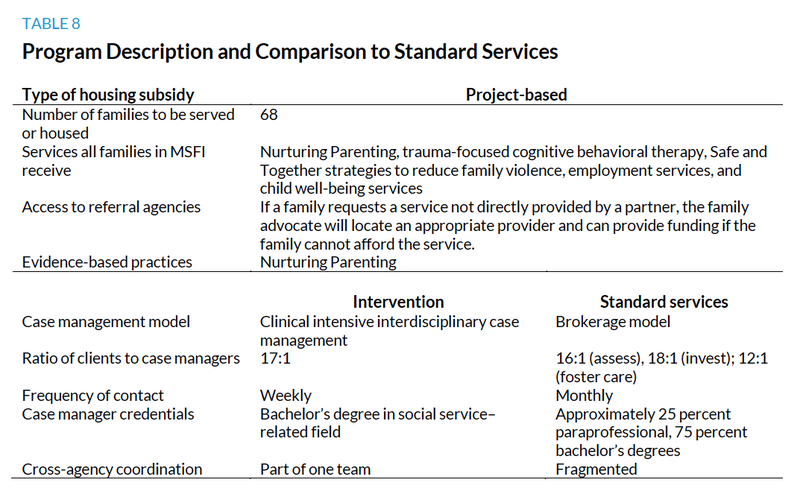 MSFI was established to bridge the gap between the Department of Children’s Services and the Central Intake for Homeless Families office to prevent the lasting legacy of child maltreatment and homelessness by creating additional resources that are evidence based and address both the housing and service needs of families (see tables 7 and 8 for more details). MSFI is led by the Community Alliance for the Homeless, the region’s Continuum of Care program lead organization. Community Alliance for the Homeless’s key partners include Tennessee Community Services Agency, the Department of Children’s Services, the Memphis Interfaith Association, Promise Development Corporation, Alliance Healthcare Services, and experts and evaluators from the University of Tennessee’s Health Science Center. MSFI seeks to coordinate the homeless and child welfare systems to address the housing and service needs of high-need families to achieve better outcomes for child and family well-being. The University of Tennessee is the local evaluation partner. Relative to the number of children in the city, San Francisco children have high rates of substantiated abuse and neglect allegations (58.3 per 1,000) and high rates of foster care placement (10.1 per 1,000 children) when compared with many other California counties (including Los Angeles County). Low-income families in San Francisco experience significant housing instability because of the lack of affordable housing and extremely high prices in the housing market. An examination of child welfare cases from 2010–11 found that 16 percent of child welfare–involved families had a parent who, at some point during the case, was homeless. Many of these families may also experience issues with domestic violence, physical health, mental health, or substance abuse. FMF is designed to improve collaboration across San Francisco agencies and service providers to better address the needs of such families. The program brings together community partners that have experience serving families with complex service needs to help stabilize families’ housing situations, provide supportive services, and improve child welfare outcomes. San Francisco Human Services Agency (SF-HSA), the local child welfare agency in San Francisco, is the organizing partner and grantee for FMF. SF-HSA partnered with the San Francisco Housing Authority to acquire a commitment to provide 20 housing choice vouchers per year to FMF. A nonprofit service provider, the Homeless Prenatal Program, works in partnership with other public and private agencies, including the Infant Parent Program, SF-HSA’s Foster Care Mental Health, and the Public Consulting Group to provide supportive services to families. Caseworkers from SF-HSA work together with caseworkers from the Homeless Prenatal Program to coordinate care for FMF participants. Chapin Hall at the University of Chicago is the local evaluator and will examine the outcomes of families participating in the FMF program. 1. Grant funding from the Department of Health and Human Services did not include housing resources; the grantees were required to develop partnerships that brought funding for a housing subsidy (tenant-based or project-based) before they applied for the grant. The authors acknowledge the site liaisons for their contributions to data collection for this report: Abigail Baum, Jennifer Biess, Rebecca Daniels, Julia Gelatt, Sarah Gillespie, Devlin Hanson, and Joshua Leopold. We acknowledge our partners at the Corporation for Supportive Housing and the Center for the Study of Social Policy, as well as the Administration for Children, Youth and Families/Children's Bureau, which funds the five demonstration sites described in this report. Finally, we acknowledge the work of the local evaluators in each site for their continuing collaboration: Barry University, Chapin Hall at the University of Chicago, University of Connecticut, University of Iowa, and University of Tennessee Health Science Center. Providing supportive housing helps decrease child abuse and neglect, keep families together, strengthen parenting, and improve outcomes for children? Providing supportive housing shrinks child welfare agency caseloads and reduces the number of children in foster care? Providing supportive housing not only improves child and family outcomes, but also helps spend taxpayer dollars more wisely? Bringing together different agencies—housing, homelessness, child welfare—and helping families navigate bureaucratic barriers leads to long-lasting systems change and services integration? The Partnership to Demonstrate the Effectiveness of Supportive Housing for Families in the Child Welfare System is a federal demonstration investigating these important questions. This brief describes the purpose and design of the demonstration and profiles the five program sites. The nonprofit Urban Institute is dedicated to elevating the debate on social and economic policy. For nearly five decades, Urban scholars have conducted research and offered evidence-based solutions that improve lives and strengthen communities across a rapidly urbanizing world. Our objective research helps expand opportunities for all, reduce hardship among the most vulnerable, and strengthen the effectiveness of the public sector. This evaluation is made possible by support from a collaborative of four private foundations: the Robert Wood Johnson Foundation, the Annie E. Casey Foundation, Casey Family Programs, and the Edna McConnell Clark Foundation. Copyright © November 2014. Urban Institute. Permission is granted for reproduction of this file, with attribution to the Urban Institute. Cover image by Matt Moyer. Used with permission from the Robert Wood Johnson Foundation.